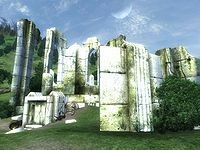 Vilverin (also known as Lake Mist Ruins) is an Ayleid ruin located in the Heartlands of Cyrodiil, on the northeastern shore of Lake Rumare. In the late Merethic Era, the Ayleids of Vilverin were among those clans who turned to Daedra worship, known as the Daedraphiles. During the Alessian Slave Rebellion, Vilverin became home to one of the Ten Ancestors, Ayleid statues originally held in the White-Gold Tower which were dispersed to cities across Cyrodiil for safekeeping. 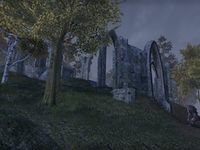 When the Tower fell to the Nedic rebels in 1E 243, the Rulanyil clan of Vilverin was forced to migrate out of Cyrodiil to avoid slaughter. They traveled to Valenwood, where they built a new city in Greenshade named Rulanyil's Fall. Vilverin subsequently fell into ruin. In 2E 582, the ruins were inhabited by a group of trolls led by the Lake Mist Fiend. Circa 3E 433, a Redguard necromancer named Jalbert moved into the ruins after being forced to flee from Daggerfall. He subsequently began to resurrect the bodies of the long-dead Ayleids in the crypts beneath the ruins. A group of bandits also inhabited the ruins, where they ambushed merchants along the Red Ring Road and collected Welkynd Stones to sell to the Mages Guild. However, the bandits soon began to fall victim to the undead when Jalbert needed fresh corpses for his experiments. The Champion of Cyrodiil then entered the ruins, slaying Jalbert and the bandits. The Champion also retrieved the ancient Ayleid statue, which was later sold to Umbacano. The settlement's original Ayleid name has been lost to time. The name "Vilverin" only came into use some time after the fall of White-Gold. For game-specific information, see the Oblivion and ESO articles. This page was last modified on 21 October 2018, at 08:13.